May 16, 2018 -- A highlight of the California Dental Association's upcoming CDA Presents 2018 meeting in Anaheim, CA, will be the many new products on display in the exhibit hall. Here we bring you a preview of these products. Our exhibit hall preview includes endodontic, hygiene, practice management, restorative, and software products. The new Gutta-Smart devices. Image courtesy of Dentsply Sirona Endodontics. Dentsply Sirona Endodontics is introducing its new Gutta-Smart cordless obturation devices at CDA Presents 2018. The Gutta-Smart devices are well-balanced and lightweight. They are comfortable to use with 360° activation rings and precise control for excellent tactile feedback, according to the company. See the device at booth No. 1302. The Sonic-Fusion. Image courtesy of Water Pik. Water Pik is launching a new device that allows brushing and flossing simultaneously at the Anaheim meeting. 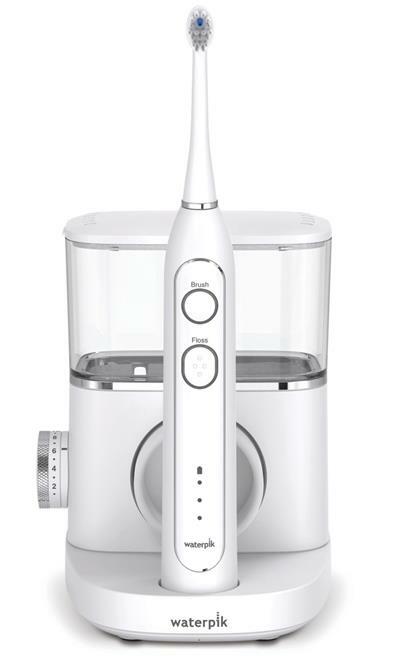 The Sonic-Fusion has the company's water flosser technology built into an advanced sonic toothbrush. 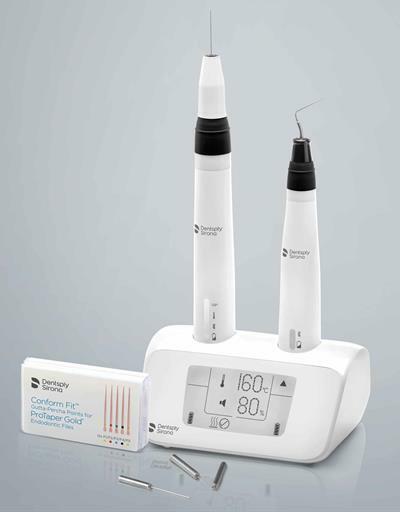 The product allows a patient to brush and floss at the same time. The device also allows for brushing and flossing separately with a touch of a button. It has 10 settings for pressure control and 60 seconds of water capacity. It features a two-minute brushing timer with a 30-second pacer. The system includes two flossing brush heads and a toothbrush travel case, and it comes with a three-year warranty. See the device at booth No. 1116. Infection control company SciCan is debuting a paperless rack and sleeve dental instrument reprocessing container. The Salus hygiene instrument reprocessing container eliminates the use of sterilization paper and pouches. The container works in tandem with autoclave monitoring systems and is suitable for use within ultrasonic and automatic washers, thermal disinfectors, and steam sterilizers, according to the company. The container maintains sterility for up to 30 days. See the container at booth No. 1674. Security health information provider Vyne is introducing a platform for the management of patient communications. The Vyne Exchange Platform technology provides payors with the ability to improve service levels with providers. The platform allows the management of member-related communications, including phone calls, emails, images, faxes, claim attachments, and other documentation. See the platform at booth No. 222. Social media marketing thought leader Rita Zamora has published a new book for dentists on effectively using social media. Get Found, Get Liked, Get Patients: Making the Most of Social Media provides practical social media tips and advice that can be implemented immediately. The book is based on common questions Zamora has received during her lectures and includes topics such as social media's benefits and how to attract new patients. Purchasers of the book will also be able to download special PDF supplements to keep abreast of significant or timely recommendations. See the book at the CareCredit booth, No. 704. Dental supply manufacturer Parkell is launching a new core composite material at the CDA Presents meeting. 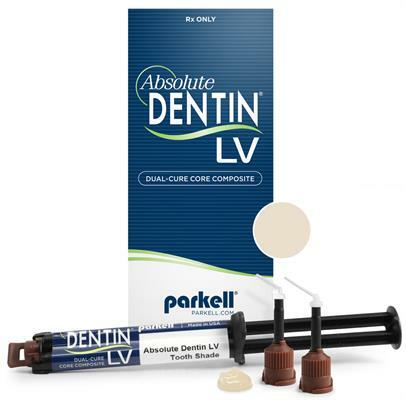 The company's Absolute Dentin LV is a nanofilled, dual-cure, core composite material packaged in a hand-dispensed 5-mL syringe. The material is available in two shades. A tooth shade is used for maintaining aesthetics under full ceramic restorations, and a white shade is for masking underlying aesthetic discrepancies. See the material at booth No. 356. 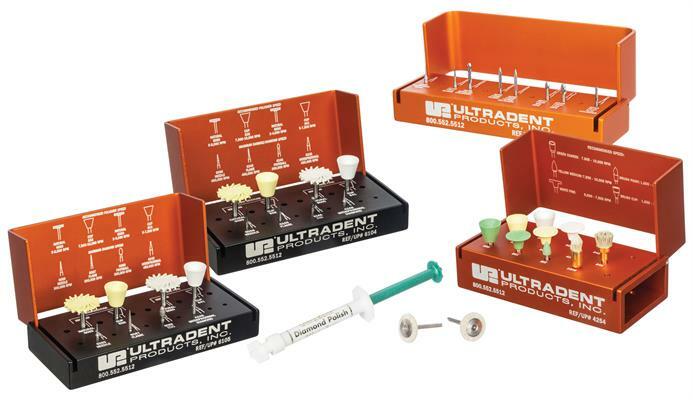 Ultradent Products is debuting a new universal composite finishing and polishing system at CDA Presents 2018 in Anaheim. The Jiffy Natural universal composite finishing and polishing system allows for the re-creation of an aesthetic, natural finish on all composites. The new kits are complete procedural systems that are ideal for finishing Mosaic universal and all other composites. See the system at booth No. 1133. The Jiffy composite finishing and polishing system. Image courtesy of Ultradent. 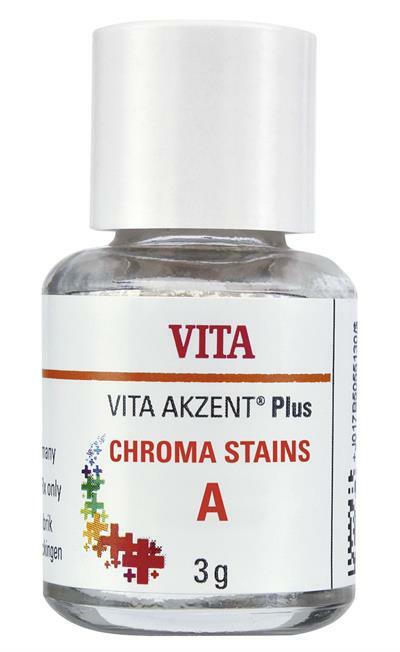 Vita Akzent Plus Chroma Stain. Image courtesy of Vita North America. Vita North America is featuring a new product that allows for the correction of restoration shades that have a poor color match. The Vita Akzent Plus Chroma Stains can change a shade value up to two shades darker, helping lab technicians and chairside-milling dentists reduce remakes that have the wrong shade in just a few minutes. The stains are universally accepted and can be used on all common veneering ceramics, monolithic zirconium, silicate, and feldspar ceramics. Dentsply Sirona is launching a new 3D-guided endodontic treatment planning software at CDA Presents 2018 in Anaheim. 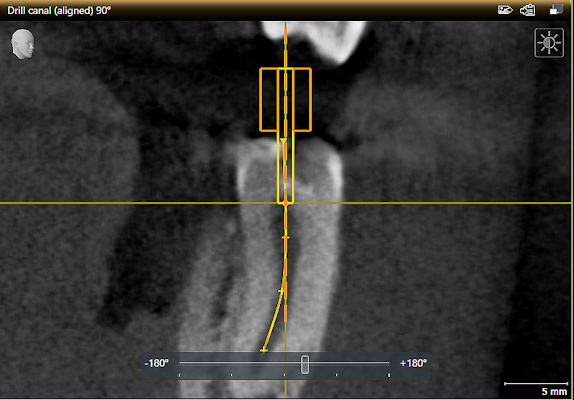 The Sicat Endo software is optimized for both 2D and 3D imaging devices. The software offers easy identification of all root canals in 3D and exact determination of working length and cavity access depth, according to Dentsply Sirona. See the software at booth No. 1302. A screen capture of a drill canal in the Sicat Endo software. Image courtesy of Dentsply Sirona.